The Proud DFT Team brings Mother’s Day Special this time. How fun is that? 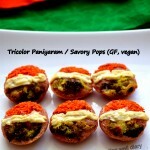 Many of us are bringing Chaat or Indian Street Food from our mother’s delectable palate. 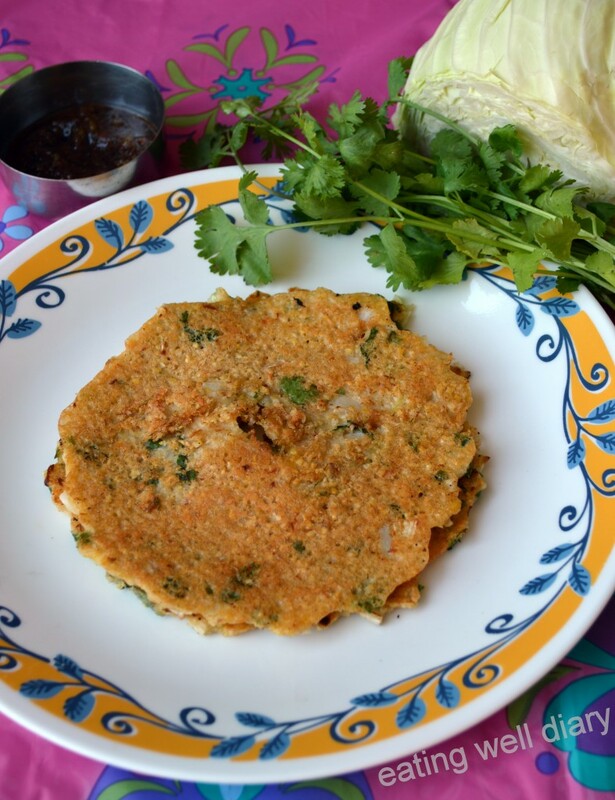 I’m bringing my mother’s favorite variety of adai, a healthy pancake that is a complete meal with the goodness of green cabbage and coriander. 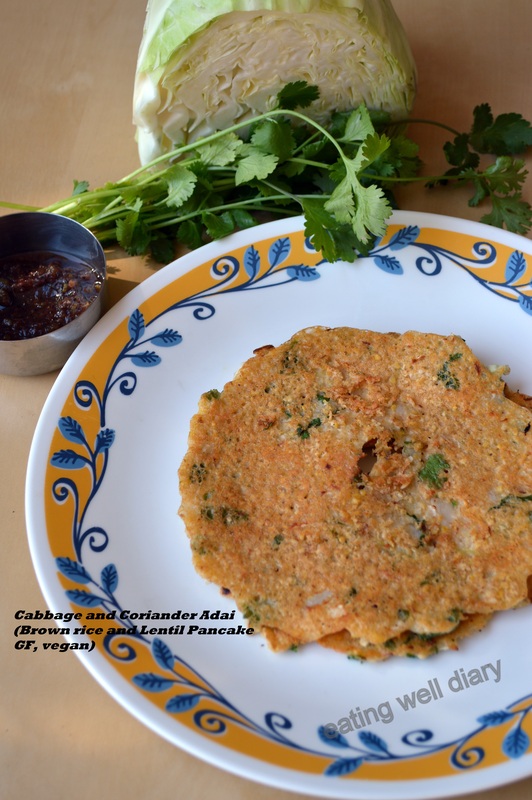 “Adai” is a traditional south-Indian savory pancake with rice and lentil batter. I have made the recipe more suitable for diabetics by using whole grain rice instead of white rice. Guess what, it does not make any difference in taste! 1. Soak brown rice separately for 8 hours or overnight. 2. 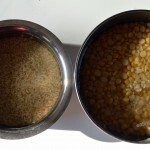 Soak lentil mixture separately for 3-8 hours. 3. Drain water from soaked rice and grind it into a smooth paste along with the red chilly in a blender, using additional fresh water. 4. Next, grind lentil mixture coarsely. 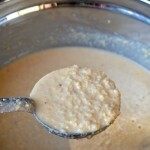 Mix with the rice batter. This batter can be stored in the fridge for 2-3 days. 5. Take finely shredded cabbage in a bowl and add some salt to it. Then as the cabbage releases water in a few minutes, rinse with some water. This removes some goitrogens in the raw cabbage (This step is optional- suggested for people with low thyroid condition). 6. 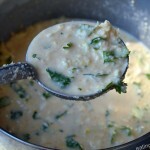 Mix in shredded cabbage, green chilly and chopped coriander to a third of the batter. 8. When the bottom turns brown, flip the pancake and add more oil around it and int he center. Wait till the other side starts browning. 9. 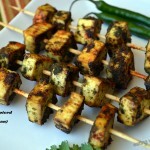 Serve warm with your favorite chutney or just eat plain. Suggested serving size is 2 medium sized adais. They will fill you up for the next few hours! Lentils are a good choice for diabetics, because they are high in fiber and therefore will help stabilize blood sugar levels. Lentils also provide a good deal of low-fat protein, which can be helpful for vegetarian diabetics. However, they are still primarily carbohydrates, so portion control is must. 1/4 cup of dry lentils makes a good meal portion. 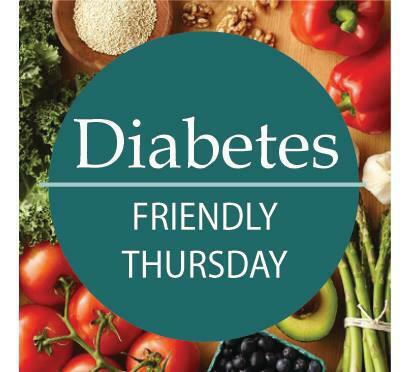 Brown rice is a better than white rice for preventing/managing diabetes. The glycemic load of brown rice is 24 as compared to 29 of white rice. While it is still high on the GI list, when mixed with beans/lentils and greens to provide protein and fiber, it is a better choice. Again, portion control is key. Cabbage is a diabetes fighting food owing to its low-carb and high-fiber properties. Together with cilantro, it provides a host of vitamins and minerals. Love this Apasara! Love Adai! Please mention the serving portion. Thanks Sonal. I just included the serving size suggestion. This is such a thoughtful addition to DFT Apsara. My mother would LOVE this too. The pictures crystal clear. Love the entire post! Thanks, Anu. Very glad you like this one! True. I don’t even make plain adai anymore, it is not fun! Thank you, Deepa. Hope you like it when you make this too! Pingback: MOONG DAAL KATHI ROLLS | LET'S COOK HEALTHY TONIGHT! I live in Patna. In my childhood, I used to have adai at a neighbour’s who were from Tamilnadu and I used to love it. Never had occasion to eat this delicious preparation after the neighbour left, since it is not on the menu in restaurants in North India. But I am going to try this now with the help of your recipe. Thank you very much. Just one question. How may adais will the above quantities of ingredients make ? Thank you so much for the comment. I’m very glad that you find it useful. I used the batter prepared above for 2 days (stored in fridge); it makes about 15 small adais. The coriander and cabbage adai is delicious. The beauty is , I like the crunchy cabbage in between the adai. 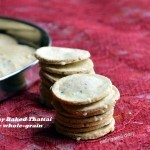 And hey, the brown rice use in the adai, just does not change taste of adai. I am now hooked into it! Last nite, I forgot to soak brown rice. I plan to have adai for lunch instead.